This is a book of poems that see the cycle of life through the lens of Wachapreague, a small seaside town on the Eastern Shore of Virginia. The book attempts to capture the reality and fantasy of Wachapreague and life. Raymond E. Vickery, Jr. has been coming to Wachapreague over the past four decades. His experiences there have inspired this book. Ray was born in Brookhaven, Mississippi. He grew up in Virginia and has lived in the Commonwealth almost all his life. He served in the Virginia House of Delegates for three terms, as Assistant Secretary of Commerce in the Clinton Administration, and as a partner in the Washington, DC law firm of Hogan & Hartson (now Hogan Lovells). He is currently a Senior Director in the Albright Stonebridge Group, an international consulting firm. A graduate of Duke University and the Harvard Law School, he is a former Fulbright Scholar in South Asia and a Public Policy Scholar at the Woodrow Wilson Center. He is the author of numerous articles on international trade and India. His book The Eagle and the Elephant: Strategic Aspects of US-India Economic Engagement is forthcoming from the Woodrow Wilson Center Press in 2011. 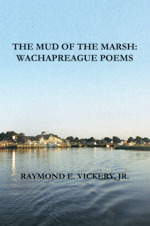 The Mud of the Marsh: Wachapreague Poems is his first book of poetry. With his wife Ann and his sons Morgan and Philip, he is at home in the 1883 LeCato House at Wachapreague and on his boat, "The Southern Cross."